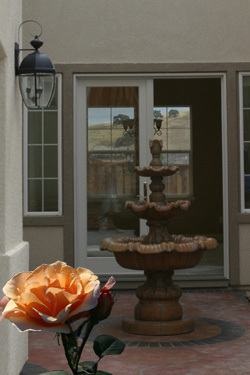 Moulding Masters craftsmen are impeccable, courteous and highly skilled. Each team member has extensive experience and advanced skill level. Every Moulding Master employee brings special individual talents to each job and my reputation is staked on their performance. We have a zero return call rate and received a 98% customer recommendation rate from DIAMOND CERTIFICATION. These are new homes with mininally nine foot ceilings. Located in the San Francisco East Bay, the owners are securing investments by adding moulding. Mark recommended 7 inch Monterey Moulding for the public areas, and he explains his choice in the videos below. Mark discusses the choice of style of moulding, the options for enhancing it with inserted colors or trim, the size of the moulding, and the use of the moulding, especially in small rooms where owners are concerned that it makes the room look smaller. In a small room moulding lifts the room. Even large moulding can be used to give a small room a finished look without creating claustrophobic feelings. 3. Kitchen with cherry cabinets - will they clash with the moulding? 4. Smaller Rooms - will the 7 inch moulding make the rooms look smaller? 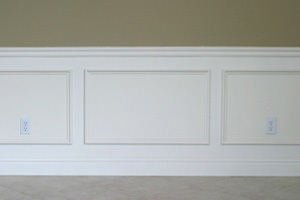 WAINSCOTING (above) with chair rail and wall frames instantly makes a house feel like a home. Trim work adds the feeling of solidity and tradition - and warmth. Today's new homes have large interior spaces which need the touch of trimwork to create the human scale. 5. 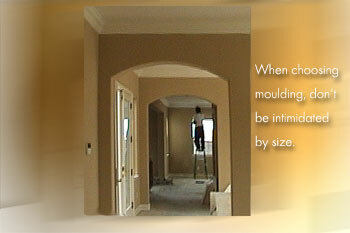 Size of Moulding - don't be intimidated by the bigger size - in larger rooms you need it. COLOR: See another East Bay Home where the owner used Moulding Master color consultant Victor Cohen Stuart. Color is a major factor in properly setting off the moulding - Moulding Masters can assist you in choosing the right color to give the appropriate level of contrast. When using the neutral tones it is especially important to let an expert guide you so have subtle but pleasing contrasts. 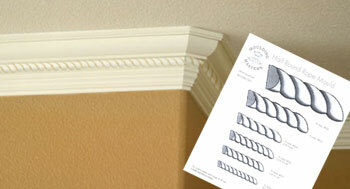 The wide shadow line in MONTEREY moulding allows for the addition of trim such as rope or beading. See our catalog for rope, bead or dental patterns to use in this style. 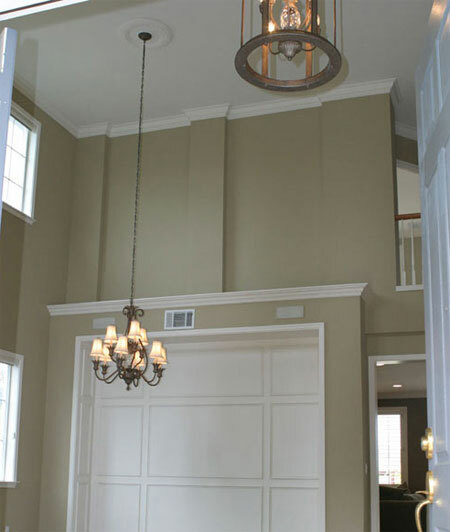 Paint color can also be used in this area to give additional emphasis to the crown. 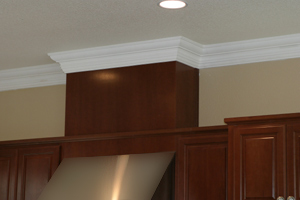 The kitchen area includes cherry cabinets which work harmoniously with the trim work. The kitchen looks out to a fountain in a patio off the entry hall. See video on kitchen. Besides being the most profitable areas for real estate investment, the East Bay offers home buyers a unique lifestyle. Access to world class wine regions, sailing, restaurants, schools, and business are all part of the story. The neutral colors of these East Bay homes complement the California landscape and lifestyle. The soft olives, mustards and golds provide the "underpainting" for additional decorations, family feasts and the daily dramas to be played out. A beautiful home provides comfort, pride and sanctuary in today's harsh world. Dreaming of a beautiful home is part of the art of living - to live in a state of optimism and hope and to be restored from the stresses of life. Since the colonial era California homes have been inspired by Tuscan, Moroccan and Mediterranean traditions; Mexico and the Pacific Rim are also strong influences. Today's California influences include cultures from around the globe. Imported furnishings and cusine are plentiful and talented chefs bring the colors and flavors of their home cuisine to the Bay Area. Fusion food is enjoyed widely and paired with world class wines from nearby wineries of Sonoma and Napa. 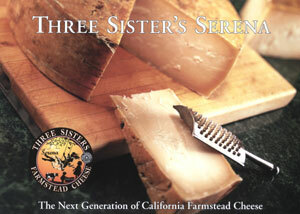 An emerging gourmet cheese industry is also developing, which is predicted to match the California wine industry's scope. Cheese makers are rapidly learning to produce and market cheeses that compete with imported cheeses. Part of the appeal for real estate investors is this lifestyle - the availability of good schools and jobs, the proximity to wine country, sailing in SF bay, skiing in the Sierras -enjoyed by an international community. The California host or hostess is likely to present several national dishes in one evening - all available at the local supermarket! Suburban supermarkets are influenced by gourment food stores, with international take out foods and large wine and beer selections. Small gourmet product farms are retirement projects for creative couples in the East and North Bay regions where the climate and marine influence are ideal for growing, making and aging cheeses, meats, wines and beers. 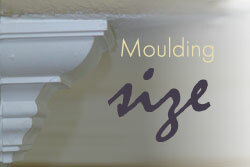 Moulding Masters customers want a home that looks contemporary, pleases the senses and provides the appropriate mood for this unique lifestyle. 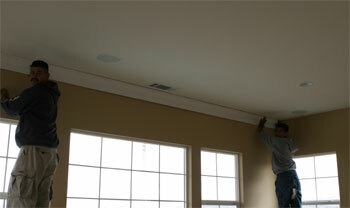 Like music, trimwork can set the mood for a dream home. The rest is up to you! So sit back, sip a brew or your favorite wine and enjoy the Moulding Masters Website and dream up your new home. BEER? Did some one say beer? California is home to a booming collection of international microbreweries. The beer big dogs play in the area too, sponsoring community events such as the one below. At left CORONA BEER is one of the sponsors for the Western States Horse Expo - a equine festival that draws exhibitors from all over the world. 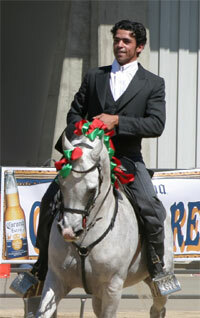 California is home to the Charros of Mexico, the Cavalieros of Portugal, and their descendents who compete in the California sport of reined cow horse. Iberian horses are popular in California and the Festival of the Spanish Horse, a colorful event with beautiful equestrian presentations to beautiful Hispanic music, fine food, wines and beers. See the COWBOY ROOM created by one of our customers. The Northern California mountains, ocean and beautiful valleys make for endless outdoor week end adventures in arts, sports or entertainment! See why so many people want to live here? Moulding Masters enjoys creating homes with the relaxed elegance and added value of trimwork - a look that is both traditional and contemporary. 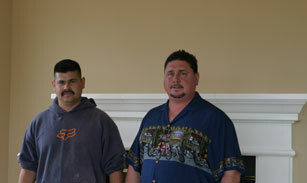 Photos below show Moulding Masters owner Mark Benda with his crew of carpenters.